This page provides information about built-in multi-monitor setup in 1.17+ version of the game. Only multimon configurations which are presented to the game as a single big resolution virtual screen are supported. You need to be using either Nvidia Surround or AMD Eyefinity or equivalent depending on your graphics chipset type. When using the game set up with multiple separate views per the instructions below, the driver based bezel correction (the one that your display drivers may offer) should be disabled and the corresponding cvars (game config variables, see bellow) should be used instead to have the game handle the bezel gaps on its own. The default interior cameras look slightly downwards to make the truck dashboard more visible. While that works well for normal monitor, it looks wrong on side views of multi monitor setup. For that reason it is recommended to set g_interior_camera_zero_pitch to 1 before launching the game to disable this feature without need to modify game data. The game supports several built-in modes. Those modes are selected using r_multimon_mode cvar. Note that all built in-modes expect at least three monitors and will actually enabled only when the resolution has aspect ratio of at least 2.5:1. 0 - Single view and UI covering entire area. The display is represented as single ultra wide planar display with the UI (user interface) covering the entire area. This is the default. The disadvantage is that because of the wide FOV (field of view), the image on the sides is significantly distorted. 1 - Single view covering entire area with the UI elements positioned in the center of the third monitor (e.g. on the center monitor in three-monitor setup). This is similar to 0 however the UI covers only the area of the center monitor. 2 - Three separate views for three monitors. Each monitor has its own view, with the default FOV of 50 degrees horizontally. UI is positioned on the center monitor. 3 - Uses leftmost three monitors from a four-monitor setup to show the same views as with 2 and the last monitor shows auxiliary view looking downwards at the dashboard and steering wheel. r_multimon_border_fov_left and r_multimon_border_fov_right - Visual angle in degrees covered by the bezel (e.g. monitor frame) between center and left/right monitor. Used for bezel correction. r_multimon_fov_horizontal and r_multimon_fov_vertical - Field of view used for each view. If only one from them is nonzero, the remaining one is calculated to keep the aspect ratio of the resolution. If both are zero, the default FOV calculation based on current in-game camera is used. r_multimon_vert_offset_left and r_multimon_vert_offset_right - Vertical offset in meters of the left/right monitor from the center one. Can be used to move the left side view up or down to improve visibility of the mirrors given the limited vertical field of view. r_multimon_rotation_center, r_multimon_rotation_left, r_multimon_rotation_right and r_multimon_rotation_aux - Additional counter-clockwise rotation applied to of views of individual monitors. Most likely used with value 90 or -90 to compensate for monitor which is physically in different orientation (e.g. portrait vs landscape) than configured in the graphics driver. This allows for mixing portrait and landscape orientations even when not supported by the driver. r_multimon_interior_in_main - Controls rendering of the cabin interior in the main views. Can be used to disable interior if some form of physical interior is present. r_multimon_exterior_in_aux - Controls rendering of the exterior to the auxiliary view (mode 3). Note that shadows are currently still updated even if exterior is disabled. This mode allows bigger flexibility over the setup for 1-4 monitors. It is enabled by setting r_multimon_mode cvar to 4. Note that unlike the predefined modes, this mode can be enabled regardless of the aspect ratio of the display. In this mode the game takes the configuration from \Documents\<game name>\multimon_config.sii. If the file does not exist, it is created the first time the game starts in this mode. You can either edit the file manually or use in-game multimon command to do most adjustments on the fly. Note that when using the multimon command, care must be taken to explicitly save the result before exiting the game or changing settings using the game options screen as the changes would be lost in that case. 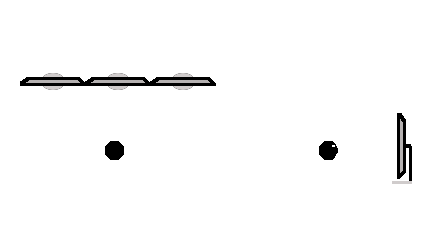 Position of the UI and monitors in the virtual display created by driver is specified using normalized coordinates where [0,0] corresponds to left bottom corner and [1,1] corresponds to top right corner. Entire monitor or UI must fit inside the [0;1] range or the behavior is undefined. normalized_ui_x - Position of bottom left corner of the UI in the virtual display created by driver. normalized_ui_width - Width of the UI inside the virtual display created by driver. name - Name of the monitor for use with multimon command. normalized_x and normalized_y - Position of bottom left corner of the monitor in the virtual display created by driver. normalized_width and normalized_height - Dimensions of the view of the monitor in the virtual display created by driver. horizontal_fov_relative_offset and vertical_fov_relative_offset - This value is multiplied by field of view of the primary monitor and added to heading and pitch of the camera. Can be used to make the monitor position itself relatively when the fov of the primary monitor is calculated automatically. heading_offset, pitch_offset and roll_offset - Rotational offset in degrees added to orientation of the camera. Can be used to point the view in desired relative direction or to do bezel correction. camera_space_offset - Offset of the camera from the standard position. Can be used to move the camera to some specific position or bias it vertically to better match physical layout of monitors. horizontal_fov_override and vertical_fov_override - Overrides corresponding field of view angle. If both values are zero, the angle calculated by the standard camera is used. 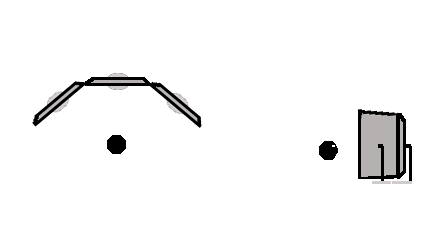 If at least one is non-zero, it is used directly and the second angle is calculated to keep the aspect ratio. render_interior - Enables rendering of the cabin interior. Can be used if you have a physical cabin. render_exterior - Enables rendering of the exterior scene (e.g. skybox, world and outside of the truck) to the view. Note that shadows cast to the view will still contain the exterior scene regardless of this setting. frustum_subrect_x, frustum_subrect_y, frustum_subrect_width and frustum_subrect_height - Allows to specify part of the full frustum cone which is rendered into the monitor. Can be used to move center of the projection outside of the center of the monitor. 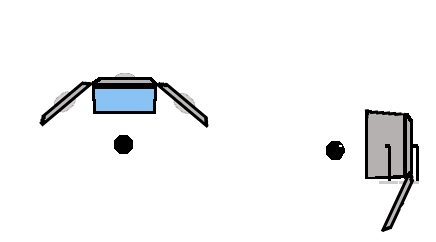 For example when using two front monitors to represent windshield of the truck while the driver is sitting before the left one, left part of the frustum can be removed to move the center of the projection before the driver. Note that change of this view will change the effective aspect ratio so both fov overrides need to be set to correct it. While the multimon command allows dynamic changes of the size of the monitor views at runtime, increasing the size can not increase the maximal effective rendering resolution beyond the resolution used by the biggest view the game started with. In that case the changed view will have proper size however its content might look blurry. To fix it, restart the game or temporarily change (and apply) vsync settings in display options after saving the configuration first using multimon save. empty - No views, UI over entire screen. This is convenient starting point for more complex custom setups. one - Creates single wide view UI over entire screen. This is similar to predefined mode 0 however it provides ability to disable interior rendering if desired. When initializing using three or three_with_dash, the state of corresponding tweaking cvars at the moment of the initialization is applied to the runtime configuration. This can be used to do basic setup using the cvars in predefined mode and use the custom mode to only tweak the result. Saves the current runtime configuration to multimon_config.sii. This MUST be used for the changes to persist restart of the game or change of display settings. Defines monitor in specified area of output resolution and associates it with specified name. Note that name ui is reserved for special use. Removes monitor associated with specified name. Marks specified monitor as primary. This should likely be the monitor in the center of the view. Sets specified attribute for specified monitor. Special monitor name ui allows changes of position of the ui itself. Prints values of all attributes of specified monitor whose name begins with specified prefix. As with set ui provides access to the ui itself.